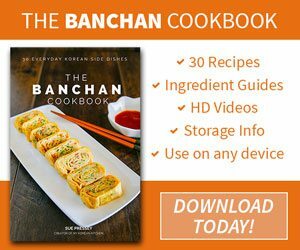 Learn how to make popular Korean hot pot dish – Budae Jjigae (Army stew or Army base stew)! 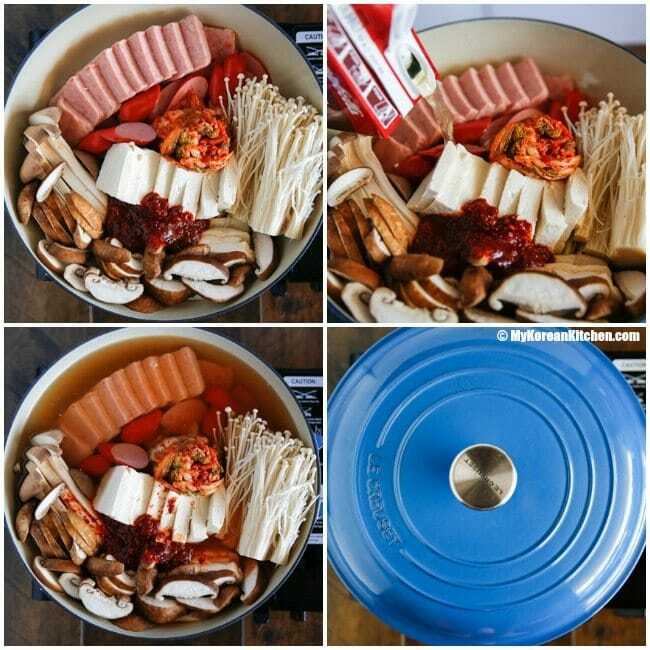 It is loaded with Kimchi, spam, sausages, ramen noodles and much more! 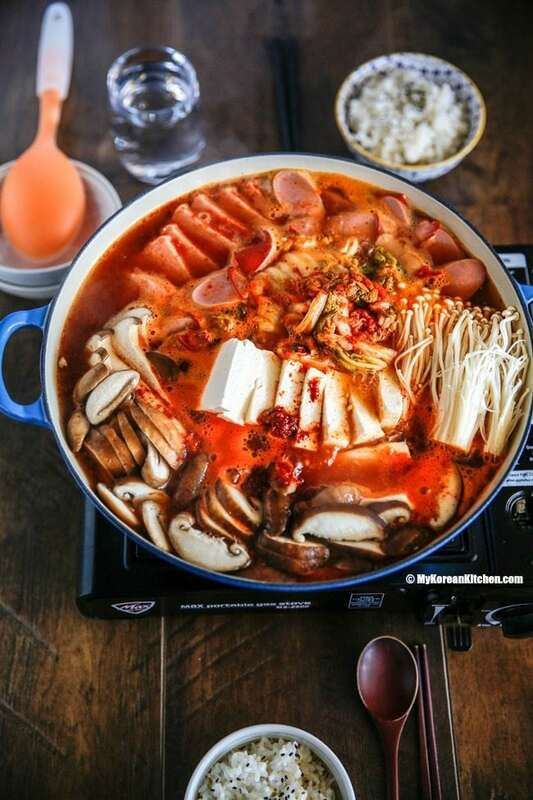 Korean hot pot dish is one of the most frequently requested recipes from my readers. Whether it’s cold weather that’s calling for this type of comfort food or you just want to have your friends and family over for this sharing friendly food, any excuses are acceptable here! 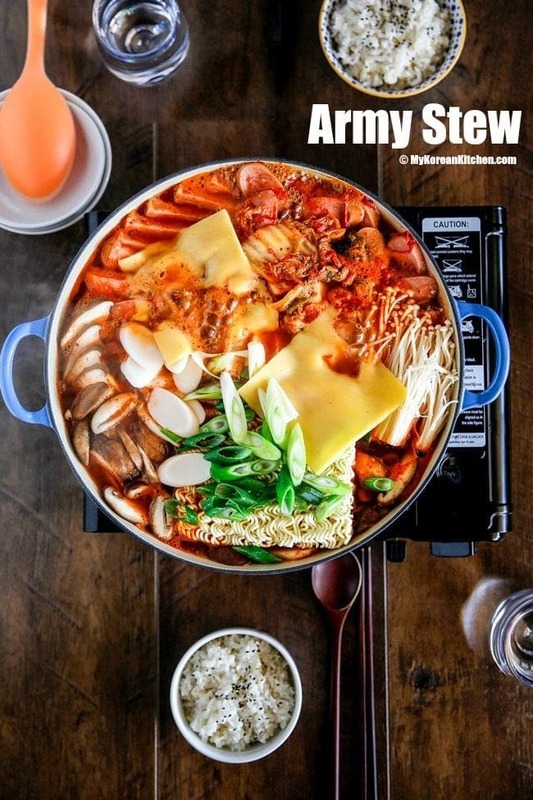 Among the hot pot varieties available, Korean army stew (Budae Jjigae, 부대찌개) is definitely one of the most popular hot pot dishes in Korea. I can vouch for this as I used to eat this army stew at least once a week with my colleagues. It’s reasonably cheap to buy and, even better, it consists of easy to find ingredients if you’re making it yourself. The best part about making this delicious stew is that the preparation is really easy – mostly involving cutting and slicing the ingredients. You can omit/substitute the main ingredients per your preference too. To fit all the ingredients below, you will need at least a 12 inch shallow pot. I used my favourite pot for this recipe and it was just the perfect size. I cooked it on a portable burner so that my family can gather around the table and serve themselves while the stew gently bubbles down. It was so convenient and keeps the soup still hot even when the heat wasn’t on it. 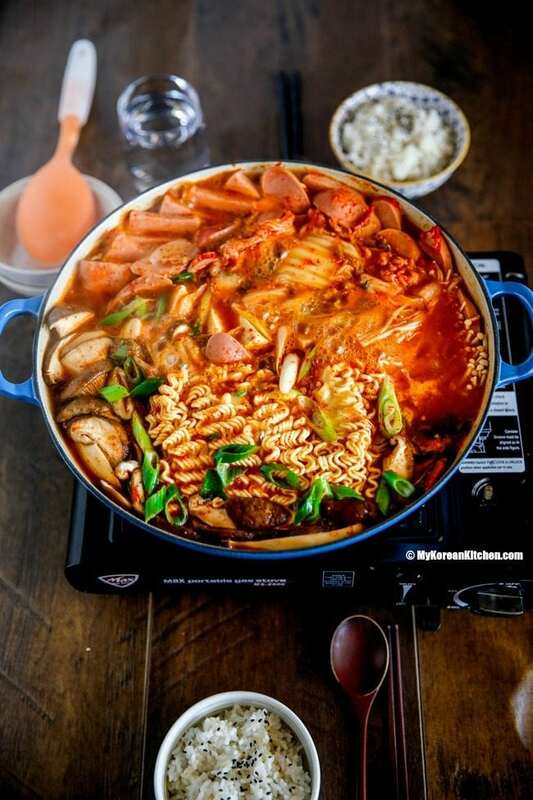 It’s really the perfect pot for Korean style hot pot, so you should check it out. P.P.S. Check out my spicy dumpling hot pot too! 1.Assemble the main ingredients (except for instant ramen noodles, rice cakes, green onion and cheese) in a shallow pot. Add the sauce in the middle. Pour the stock in the corner of the pot. Close the lid and boil it on medium high heat until the stock starts to boil (about 8 mins). 2. 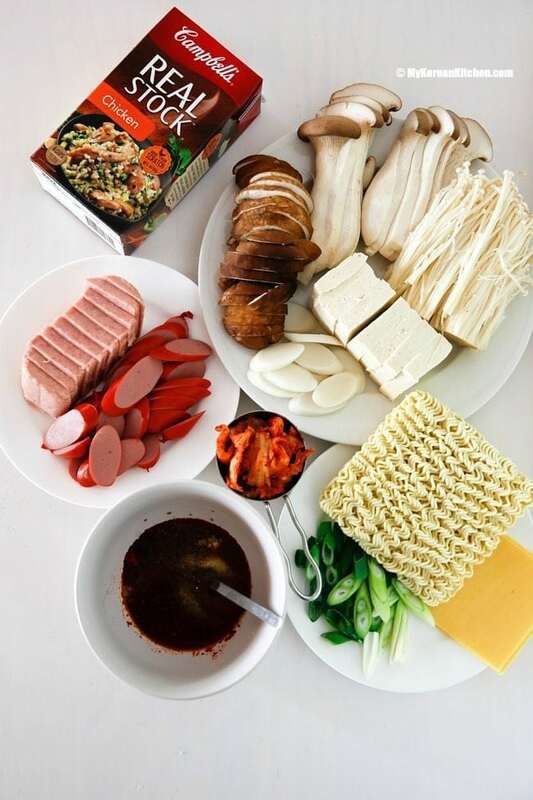 Add the remaining ingredients – instant ramen noodles, rice cakes, green onion and cheese on top of the pot and boil uncovered until the noodles are cooked (about 2 to 3 mins). Reduce the heat to low (if you’re cooking on a portable burner and sharing the food at the dinning table). 3. Start dishing out soup, protein and vegetables onto your own soup bowl. Serve with steamed rice (& with other Korean side dishes). I used store bought chicken stock, which saved at least 30 mins or more of potential cooking time compared to making it from scratch. According to the package, it contains chicken stock 98% (water, chicken, carrots, celery, cabbage, onions, sage extract, parsley), salt, sugar, yeast extract. As I can’t guarantee that every chicken stock you buy will give a result the same as mine, if you’re unsure, I suggest you mix with water (e.g. 2 cups water & 2 cups chicken stock) to ensure the chicken stock does not have too much overpowering taste. Alternatively, you can use homemade dried kelp & anchovy stock or beef stock. Get the homemade beef stock idea from this recipe. FYI, I didn’t like a store bought beef stock for this recipe as I thought it was a bit too salty. 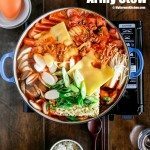 The best and the most popular Korean hot pot dish – Budae Jjigae (Army stew / Army base stew) recipe! 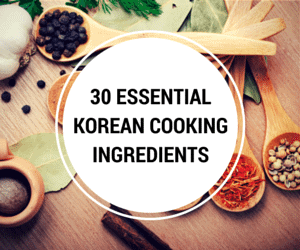 It is loaded with Kimchi, spam, sausages, ramen noodles and much more! Assemble the main ingredients (except for instant ramen noodles, rice cakes, green onion and cheese) in a shallow pot. Add the sauce in the middle. Pour the stock in the corner of the pot. Close the lid and boil it on medium high heat until the stock starts to boil (about 8 mins). Add the remaining ingredients – instant ramen noodles, rice cakes, green onion and cheese on top of the pot and boil uncovered until the noodles are cooked (about 2 to 3 mins). Reduce the heat to low (if you’re cooking on a portable burner and sharing the food at the dinning table). Start dishing out soup, protein and vegetables onto your own soup bowl. 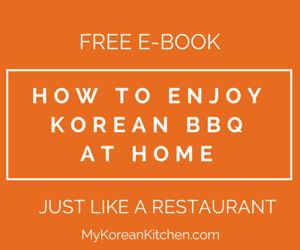 Serve with steamed rice (& with other Korean side dishes). A Korean friend made this for our group of friends in Grad school…but also put a large can of Baked Beans in, and that seemed to be one of the rudimentary ingredients. Did you leave them out by choice? Thanks a lot for the recipes. I’m planning to immigrate Korea and I love Korean food. I have made some Korean dishes. I hope I can learn to make more dishes from you. Love the look of this, I’m not a lover of super spicy food so would it be wise to start with half the amount of chilli paste and flakes for the first time trying it? Hi Rob, yes, you can do that. You may want to add a bit more soy sauce or salt to season then. I would like to know, is the calorie count 653kcal/serving or for 4 servings? It’s per serving. And, it’s an estimate only based on online calculator! Hello! If I’m using the same chicken stock as you, will I need to add water to it? What kind of ramen noodles do you use? I like thick and chewy ones. Can I find them at Oriental market? Any particular brand you like? Hi Niki, Ultimately you can add any types of noodles that you like. But I used this instant noodles. 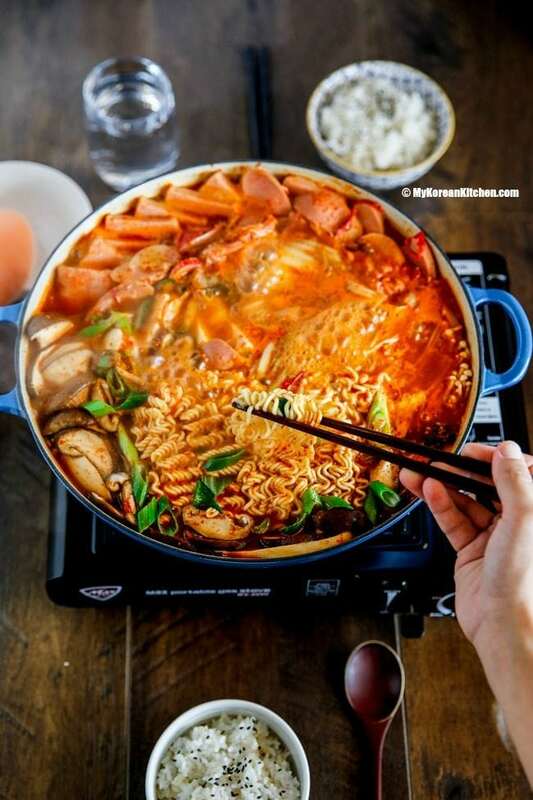 https://amzn.to/2eojKLa The most popular Korean instant noodles. 🙂 Available at Korean / Asian grocer. I think Costco also carries it. This is one of my favourite Korean dishes. I wish all the ingredients were easily available in India. I have always wanted to make this but I was wondering if there was a possible substitute for the mushrooms? I am not particularly fond of them. Hi LawLis, if you don’t like mushrooms, you can skip them and add more of other listed vegetable and/or (processed) meat ingredients. Alternatively, you can add your favourite vegetables (e.g. zucchini, egg plant etc) that’s not listed here too. Hope this help! I’m constantly on the hunt for asian soup recipes I can make at home. My favourite food in the world used to be our local chinese restaurant’s bejing soup, but I haven’t had any since I’ve become a vegetarian a year ago. I’m happy to say, I have a new favourite food in the world! I used brokkoli and peppers instead of the spam and sausage, but the kimchi and the sauce are absolutely delicious. Even my picky roommate enjoyed it! I can’t wait to try this thank you so much. I’m going to Germany and going to make it for friends there. Hi Sue. Just want to clarify that it’s 2 Tbsp Korean chili flakes (Gochugaru) and 1/2 Tbsp of the paste (Gochujang) and not the other way around? I tried it and wow its so delicious and my family loved it also. Thanks for the recipe its easy to follow. Cant wait to try another one of ur recipe. Wow….! My mouth is watering! I used to have Chinese hot pot with friends while I was living in China. So much fun. I never try this Korean style with cheese on top. Very interesting! I’ve never tried Chinese hot pot, but will have to try it soon. Anyway, I hope you try my Budae Jjigae soon! Definitely fun to do! I am planning on making this stew tomorrow for New Years Eve with friends and I can’t wait! I recently had my wisdom teeth removed and I’m not supposed to have spicy food. Is there any way to modify or just simply reduce the amount of hot pepper? Looks so good. I must try to make it at home. Would you be able to tell me what camera and editing process you use? Thanks, David. I’m using Canon 5D Mark III with Canon 24-70mm. For editing, I use Adobe Lightroom. I’m sure it’ll be fantastic. I’ll report back with the results. I should clarify, we were looking at a different website when I asked my wife to use the recipe we were looking at. 🙂 I appreciate your wife’s trust on my recipes! I hope I didn’t disappoint you both! I don’t know how you do it but everything of yours we’ve tried tastes so amazingly authentic and delicious. My late Korean wife made a similar dish she called Duk ramen. She used the sliced rice cakes, ramen noodles, green onions, and whatever vegetables and meats we had in the house. That was always one of my favorite Korean dishes. After she passed I was never able to replicate it on my own. I know this recipe might not give you the exact taste you’re looking for but I do hope it gives you a little bit of comfort at least! Hi Aurii, the recipe is available above now. It wasn’t visible for a few hours for some reasons. Thanks for reporting the issue! I really appreciate this! 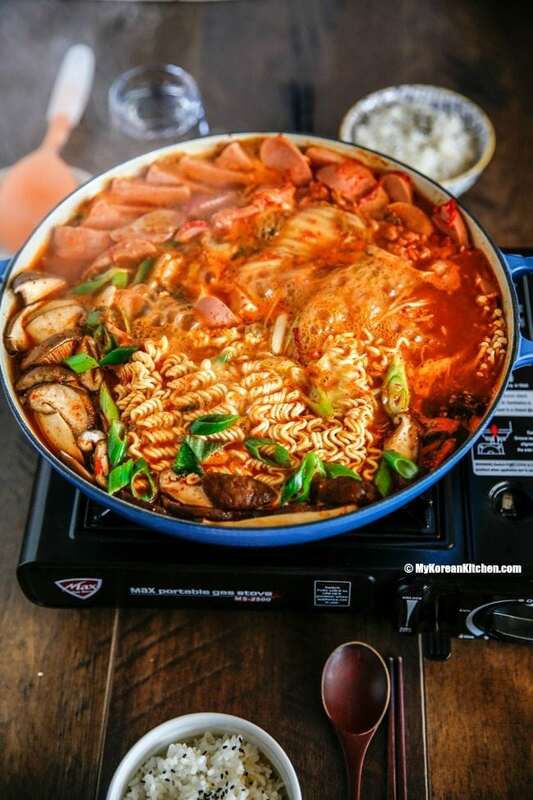 Last weekend, I made Army Stew, it came out very good, so delicious , my family loved it.i had my nice came over for dinner, she asked me for the recipe and I gave her your My Korean Kitchen side so she can find some more good stuffs in there..
Hi Mai, So happy to hear that!! 🙂 Thanks for referring my website as well. I appreciate it! Looks delicious. Just wondering how is the sauce used? Is it put into the soup pot or as a dipping sauce? It’s put into the pot and boiled with the stock. (If you look closely on the step 1. photos, it’s partly sitting on tofu. 🙂 ) Enjoy, Esther! It did. My family loved it. Thank you. Love your soup, yummy ? Look so good ,mouth watering. OMG….. This makes my mouth water just READING IT. Thank you .